Small Groups is a way to to grow in your faith through study and your personal relationship with fellow Christians. The sound and light team is made up of volunteers and headed by the Worship Committee. The team is currently made up with Wayne Pruitt, Craig Haddock and Weldon Hill. The duties of the SALT Team is to run and maintain the sound, lighting and internet service for all official church functions. A SALT member is the first to arrive and one of the last to leave any church function. 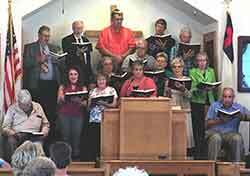 They make sure those in the nursery and fellowship hall can see and hear the service. 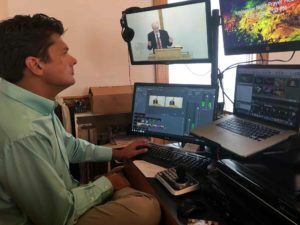 The SALT team also runs our live stream on the internet so that those who cannot make it to church can watch and listen. This is a vital service for our shut-ins, care givers, vacationers and potential visitors. SALT also maintains the wireless internet throughout the campus. We make and edit video for promotional purposes for church functions. SALT also provides service for funeral services for the family of church members. For personal functions such as weddings and reunions, arrangement can be made to have a team member to run furnish services. We are always looking for volunteers to serve in this ministry and will furnish training before you serve in this ministry. Just contact the Worship Committee or another SALT member for more information. This is what the Shearer Choir does under the direction of Gail Parker. Gail is always looking for new members who like to sing. If you are interested then contact Gail or just show up for practice on Wednesday night at 8:00 PM in the choir room located in the education building.